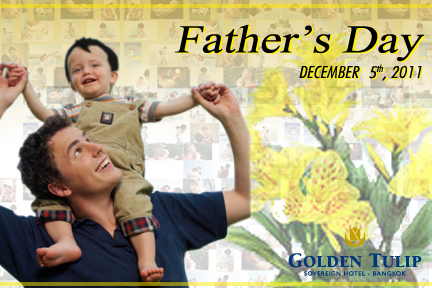 This Father’s Day weekend, the Golden Tulip Sovereign Hotel Bangkok is preparing an unforgettable moving event and activities for you and your family. It has been a long year to come this far, it is time to treat and reward yourself with something delicious! • At 92 Café and Nishiki Japanese Restaurant, for Buffet Lunch and Dinner, your father is free. • At Fook Yuan Chinese Restaurant, father will get “Siew – Tor” or Chinese Bun 1 piece per person. • At Tubtim Siam Thai Restaurant on top of our hotel on the 24th floor will get the Thai Healthy Set Dinner free for dad. Every father will receive a Canna Lily : Puttharaksa flower and 1 family photograph.